This being our first visit to South America, we figured that Brazil, with its newfound status as emerging economic powerhouse and upcoming host nation of both soccer’s World Cup and the Olympics, would be a good place to start. What we found was a photogenic country, albeit a study in contrasts, populated (mostly) by warm, free-spirited, sport-loving people. Travelling to Brazil requires the acquisition of a tourist visa. 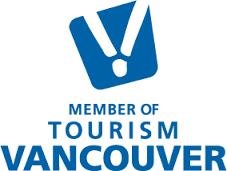 The Brazilian Consulate in Vancouver can require anywhere from about 10 to 20 business days to process these visas, so it’s very important to plan well in advance. The Consulate’s website cautions, “do not book flights or make travel arrangements before having a visa issued and at hand”, although adequate forward planning should be sufficient. We flew on Air Canada via Toronto into Sao Paulo’s Guarulhos International Airport. Sao Paulo is an enormous city, largest on the continent, largest in the southern hemisphere, with a metropolitan population of 20 million. Arriving here was a bit daunting, so we opted to take an “official” airport taxi, with a set, prepaid fare, purchased from a booth within the airport. Sao Paulo’s traffic can be nightmarish, and even arriving midday on a Saturday presented us with good hour’s long drive to get to our hotel 30km from the airport. Our hotel in Sao Paulo was the Tulip Inn Paulista Convention, chosen for its convenient location, within walking distance of Avenida Paulista and Parque Iberapuera. It is prudent to research Sao Paulo’s neighbourhoods prior to embarking on a walking tour, as there certainly some places less safe than others. On the Saturday night, we headed by metro to the neighbourhood of Vila Madalena, where we enjoyed a lively dinner at Empanada’s Bar. After dinner, we strolled around this vibrant area, with restaurants and pubs overflowing with young paulistanos spilling out onto the sidewalks and streets.The next day, it being a Sunday, we headed to Parque Iberapuera where we visited the Museum of Modern Art and the Bienal de Sao Paulo. We spent literally the entire afternoon exploring the Bienal, housed in the Ciccillo Matarazzo Pavilion, one of renowned Brazilian architect Oscar Niemeyer’s creations from 1957. Throughout Brazil we encountered the name Niemeyer, and many of his wonderful buildings. Coincidentally, Mr. Niemeyer passed away at the age of 104, less than a month after our visit. On our last full day, we visited the Sao Bento area, the city’s financial core with its impressive architecture including the Banespa Building (clearly inspired by the Empire State Building) the Metropolitan Cathedral, the Mercado Municipal, and the Sao Bento Cathedral. Spending a full day walking in 35C heat was exhausting, and even the city’s public parks are gated shut on Mondays (as are the museums)! On our way back to the hotel, we passed through Liberdade, home of Sao Paulo’s Chinatown. In the evening we headed to the Jardins neighbourhood, quite an upscale area of the city, again with many restaurants, bars and cafes to choose from. 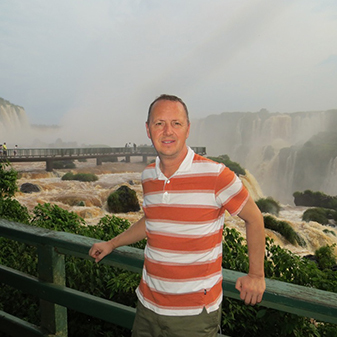 From Sao Paulo, we flew to Iguassu Falls, listed as one of the New 7 Wonders of Nature. 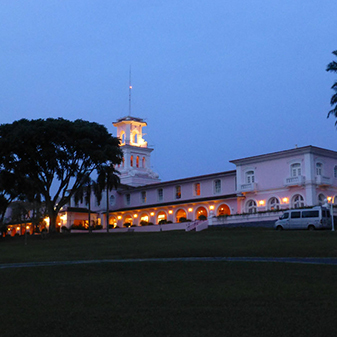 Our hotel was Orient Express’ Hotel das Cataratas, located inside the Iguaçu National Park. Staying at this charming colonial-style property meant that we had the waterfall all to ourselves after 6pm every evening, and until 9am every morning. On our first morning, we woke at sunrise and spent a magical hour, just the two of us, literally cheek to cheek with the falls, truly a wonderful experience. But the topper was still to come, as on our second night, we joined a midnight guided walking tour to witness a moonlight rainbow over the falls. This natural phenomenon is only visible a maximum four days per month, requiring a full moon and clear skies, so we consider ourselves very fortunate indeed. Along the breadth of the nearly 3km gorge, there are approximately 300 distinct waterfalls. We spent much of our two days here strolling along the edge of the gorge, to the Devil’s Throat, the main cascade, and back, admiring the abundant flora and fauna along the way. We spotted toucans, raccoon-like ring-tailed coati, butterflies, spiders, millipedes, and even a rather large capybara. For the adventurous, there are jetboats, rafting, rappelling, and the like. Being that we were staying in a luxury hotel, we were content to sip capirinhas poolside. Our next stop was Porto Alegre, in the state of Rio Grande do Sul. The populace of this southern state like to think of themselves as “gauchos” or cowboys, identifying primarily as residents of the Patagonian pampas (grasslands). Porto Alegre proved to be a pleasant surprise. Our short taxi ride from the airport led us through several uninspiring barrios before we reached Moinhos de Vento, definitely the nicer part of town, and the location of the Sheraton Porto Alegre. This neighbourhood is home to numerous restaurants and bars, all nicely laid out in front of our hotel. We had a fun dinner at the Boteca Natalicio, as recommended to us by a super-friendly front desk agent at the Sheraton. It was so much fun that we went back again the next night! Botecas specialize in “chopp”, or draft beer as we know it, with lots of meaty/cheesey tapas for accompaniment. We took the open-topped sightseeing bus to get an overview of the city, and then returned on foot to get a more indepth look at the structures that caught our eyes the first time around. In particular, we appreciated the Usina do Gasometro, a old powerplant repurposed as an art gallery and movie theatre; and Shopping Total, an old beer factory turned into a shopping mall. Porto Alegre is also home to “the most beautiful street in the world”, Rua Gonçalo de Carvalho, a 500m green tunnel of enormous Tipuana trees. From here we took a sidetrip over to Buenos Aires, Argentina, and that’s when things took a panicky turn. At the Porto Alegre airport, the Aerolineas Argentinas agent advised that three items were required, namely passport. Brazil departure card, and proof of payment of the Argentina Reciprocity Fee. This fee had always been payable upon arrival into Argentina, but a few days prior the policy had changed, for flights into Jorge Newbery (AEP) airport only, and the fee had to be paid in advance, online, no exceptions! We had about 30 minutes before the flight closed to find an internet café, and process the application and payment. We found out the hard way that using Firefox as a browser wouldn’t support the online payment. Only through sheer persistance and the last-minute assistance of the AR supervisor did we manage to make the flight, getting our boarding passes printed only about 45mins prior departure, and being escorted through security! Buenos Aires is heartbreakingly beautiful, with its superb early 20th century architecture in various states of decay. The sheer number of structural gems left us in awe. 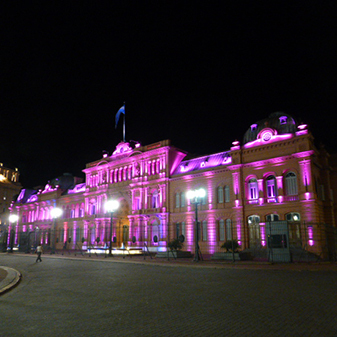 In particular, the Mercado Central, the Teatro Colón, the Casa Rosada (especially at night), and the Metropolitan Cathedral were all impressive. Walks through Palermo and Recoleta neighbourhoods were extremely pleasant, and a visit to the cemetery in Recoleta, which includes the tomb of Eva Peron (family Duarte), is a must. The Puerto Madero district is the revitalized former city port, and features a wonderful Calatrava pedestrian bridge, the Puente de la Mujer, and many gleaming highrises, akin to Vancouver’s Yaletown. A word of caution, if you love walking a city, as we do, keep one eye cast downward at all times, otherwise you may end up with a sprained ankle due to sidewalks in dire need of repair. We were lucky to be able to ride aboard the original 1913 underground carriages of Subte Line A, with their wooden interiors from 1926. These Belgian built rolling museum pieces are soon to be replaced by modern Chinese-made units. For meat-eaters, the beef to be found in Argentina is unsurpassed anywhere else on earth, with great steak restaurants scattered throughout the city, our favourite being Chiquilin, within walking distance of our hotel. The empanadas weren’t too bad either. 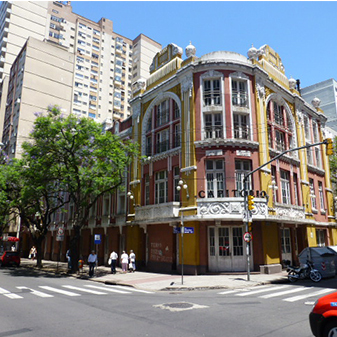 Our hotel, the Novotel, was located on Avenida Corrientes, the heart of B.A.’s theatre district, and just a few blocks from the landmark obelisk on Avenida 9 de Julio, the city’s grand north-south boulevard. The Novotel’s courtyard with its living walls and swimming pool (and bar) were certainly a welcome oasis from the hot hubbub visible through the lobby on Corrientes. After three days in Argentina, it was back to Brazil, and what turned out to be my personal favourite destination on this trip, Florianopolis. This city is located primarily on the Island of Santa Catarina, and is the capital city of the state (also Santa Catarina). Being a somewhat smaller city, with metropolitan area of population around 1 million, it felt noticeably safer here than some larger Brazilian cities. Florianopolis boasts 42 beaches, and has garnered such unofficial titles as “party destination of the year” (New York Times 2009), “one of the ten most dynamic cities of the world” (Newsweek 2006), and “the best place to live in Brazil” by Veja magazine, a Brazilian publication. We absolutely loved the public bus system on the island, which operated in hub and spoke style, with 3 or 4 main terminals, and local routes radiating out from those. With just one fare, of approx $2CDN if memory serves well, we went all the way north to the beach at Canasvieiras. We chose this beach for its calm waters, and we were not disappointed, spending nearly the full day in and out of the gentle surf. We strolled much of the length of this blinding white beach, whose grains are so fine they squeak when you walk upon them! A delicious lunch of freshly caught seafood at a beachside restaurant and bar, under an umbrella, bare feet in the sand, sun glinting like diamonds off the water, what more could one ask for? Next stop, Rio de Janeiro! Approaching by air, Rio was a beautiful sight to behold. One can hardly travel all the way to Brazil and not visit Rio, but it wasn’t my favourite stop by far. The view from our hotel, the Sheraton Rio, was spectacular, looking north across the beaches of Leblon and Ipanema. Our half-day open jeep sightseeing tour was fun, as we whizzed past these beaches, plus Copacabana, and Sugar Loaf. 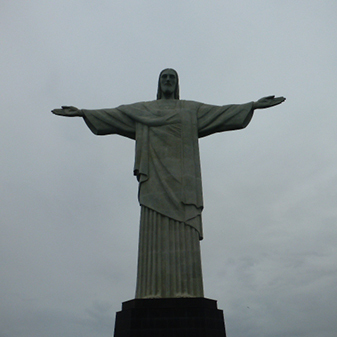 From there it was up to Corcovado through the Tijuca Forest to the iconic art-deco Christ the Redeemer statue. And, unfortunately, that’s about it for Rio. I’d suggest that if you’re not into nightclubs, then Rio’s not for you. Mind you, we had enjoyable casual dinners in Leblon and Copacabana both nights we were there. The shopping looks like it might be great. 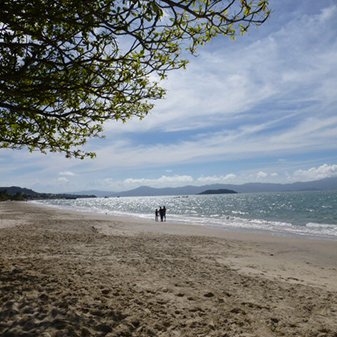 The beaches are unbelievably enormous, but the water was much colder than it was in Florianopolis, too cold for swimming. And finally, each time we got in a vehicle, we inevitably got stuck in a deadstop traffic jam. Our final stop was Belo Horizonte. The Confins (CNF) airport is 40km from downtown, but an airport coach departs every 20 minutes to the city centre, and it’s a smart move to save some taxi fare. Our hotel in Belo Horizonte was the Mercure Lourdes, quite conveniently located, walkable to city centre and the bars and restaurants on Rua Sergipe. It’s unfortunate that we didn’t have a little more time to explore this city and particularly the surrounding area. Belo Horizonte was established as a replacement capital city of the state of Minas Gerais in the 1890’s. It was laid out in a fascinating diagonal grid fashion, making it suprisingly easy to get disoriented. We spent a couple of fascinating hours at museum called Memorial Minas Gerais – Vale. The museum is housed in a beautiful building, with a wide variety of interactive displays and art. We both agreed it was one of the most enjoyable afternoons we’d ever spent in a museum, anywhere! It being our last night in Brazil, we made sure to go out in carnivorous style, with a trip to one of the best churrascurias in town, the Fogo de Chau. Not only were the quintessential skewers of beef, pork, lamb and chicken outstanding, the salad bar was incredible too! The staff were extremely attentive, the meat just kept on coming, and we ended up well and truly stuffed! Before heading out to the airport for our 6:00 pm flight, we were lucky enough to be able to visit the Palacio da Liberdade, the governor’s palace, only open to the public on Sunday mornings from 9:00am to 12:30 pm. Group tours depart whenever there are sufficient visitors, but since the groups were all Portugese speaking, we got our own private tour, with an English speaking guide! From there we headed by public transit out to the Pampulha architectural complex, and its star attraction, the Igreja Sao Francisco De Assis. This unorthodox church was designed by famed architect Oscar Niemeyer, built in 1943, but not consecrated until 1959, since it was deemed unfit for religious purposes by the archbishop of the time! The overall impression of Brazil is of a country in transition, on its way to being one of the world’s powerhouse economies. The wide gulf between the well-to-do and the favela dwellers is still difficult to come to terms with, and personal safety is something that all travellers should keep front of mind, particularly in the planning of walking excursions. Finally, the internal air travel system is very comprehensive and affordable, so much so that we sometimes paid as much on taxi fare from airport to hotel as we did on airfare from city to city!